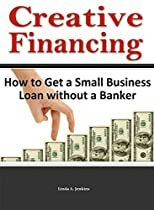 Creative Financing: How to Get a Small Business Loan without a Banker, is your guide to effectively using social lending to fund your company. The author, Linda Jenkins, is CEO of GoldAllianceGroup.com, an online resource for new small business owners. She is also an active investor and consults for Jenkins & Company, PC. You want to know how peer to peer lending and crowdfunding works. You own an online business and bankers have trouble evaluating your company. You own a retail store and are considering alternative financing. You need to raise more money for your business than your family can lend. This version is updated with additional funding resources.